Shortlisted McKinsey applicants undergo two types of interviews: experience and case interviews. In the former, your work history, education, and skills are assessed, and in the latter you will be given a business case to resolve within a limited period of time. The McKinsey case interview is a tool to measure your capability to analyze a problem, break down complex components, and generate sound recommendations for a client. Most of the problems presented are actual cases that have been handled by professional consultants. The interviewers don’t expect you to provide accurate answers; they evaluate your thought processes and ability to communicate ideas in a stressful situation—attributes that are essential in the everyday life of a McKinsey consultant. Think aloud. Interviewers are interested in knowing how you derive your conclusion and recommendations. Don’t keep things to yourself; explain your reasons for accepting or rejecting an option. Ask questions. If you need additional information, don’t hesitate to ask the interviewer. Some won’t give additional details unless asked. It’s their way of checking your research skills. Be efficient. A case interview only lasts for 30 minutes, so be sure to process all elements of the case during that period. If you practice before the interview, you will learn techniques that will expedite the process. Improve your mental math. You will most likely need to make calculations during the interview. If you are able to mentally compute, you will save time and impress the interviewer. 7S Framework Developed by Robert H. Waterman, Jr. and Tom Peters, 7S is used to evaluate and keep track of the changes in an organization’s internal operations. 7S refers to the interrelated factors that affect those changes. Industry Cost Curve This graph may be used in analyzing the dynamics of pricing and competition. It was formulated by Rob Latoff, a McKinsey director. The Business System Kevin Coyne describes his concept as a framework that can formulate a business strategy. When you practice resolving cases, apply various frameworks. The more frameworks you master, the easier it will be to identify the appropriate structure to use for a specific problem. However, during the actual interview, make sure you listen carefully to the presented business dilemma and don’t immediately relate the problem to a framework you have practiced; otherwise you will overlook essential details. When you decide to pursue a career in management consulting, you accept the fact that you will need to ace a few case interview rounds before you can sign the employment contract. A business situation will be presented to you; you are expected to analyze the scenario and generate sensible recommendations within a limited period of time. This type of interview aims to assess how you apply logic in resolving an ambiguous and stressful situation. The prospective firm wants to know if you are analytic, organized, and sharp enough to handle the responsibilities and duties of a consultant. Your communication skills will also be evaluated as this ability is crucial in conveying important messages to both client employees and top management. The key to mastering this challenge is practice. Familiarizing yourself with various business cases and frameworks equips you with an in-depth understanding about the nature, requirements, and process of the interview. Take full advantage of the free resources on the websites of top consulting firms such as McKinsey, Bain, BCG, and other reputable firms. 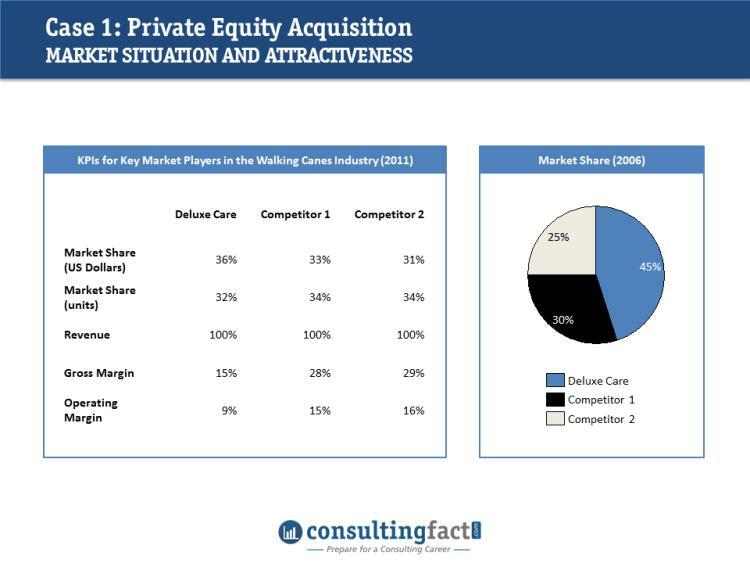 As an additional preparatory material, below is a private equity acquisition case taken from Consulting Job Academy, one of the best online courses for management consulting applicants. This excellent example details the logical process of arriving at the final conclusion, thereby giving you concrete guidelines on how to manage your actual case interview. Greystone Partners, a North American-based private equity firm, is considering the acquisition of Deluxe Cane, the leading manufacturer of walking canes for the elderly in the US. Greystone Partners has engaged your team to help determine whether to proceed with the investment. Estimate the market size for walking canes in the US. Is the market attractive? How is the financial performance of Deluxe Cane? You have just run additional competitive analysis and found that Deluxe Cane’s two largest competitors operate as part of larger organizations that sell related mobility devices. Using all the information you have collected thus far, do you believe Deluxe Cane is competitively positioned? What other issues would you want to analyze before making an investment decision? Should Greystone Partners invest in DC? Estimate the market size for walking canes in the US? Is the market attractive? Secondly, you will make the estimations. You can either make your own assumptions or ask for inputs. Now you can do the actual calculations. The population over 70 years is 45 million and 40% of these need a cane. That is 18 million. Assuming that the average life of a cane is 5 years, one-fifth of these 18 million buys one cane every year. That is 3.6 million canes annually. The second part of the question leads to the discussion of market attractiveness. The four factors that drive this are market performance, competition, suppliers, and customers. Because you do not have any information about suppliers and customers, you would make your analysis based on the remaining two factors. Market performance. You already know the size of the market, and you can see that at least Competitor 1 and Competitor 2 have solid operating margins. You should also make a comment about market growth, which is typically population-driven at about 3% per year. Aging populations will likely cause the market growth to increase. Competition. The competition is limited with 3 large players with about 1/3 market share for each. It would be hard for customers to find substituting products, and the fact that there are only 3 players indicates that the market is difficult to enter for new players. This is a good competition situation. Based on this analysis, the market seems attractive. You would want to comment that an analysis of suppliers and customers is also necessary to make a sound recommendation. Discuss that revenues are larger than the share of volume. The prices of Deluxe Cane’s canes are higher than the prices charged by the competition. Does this matter? Yes, walking canes are largely a commodity product and the elderly, living on fixed-incomes, are price sensitive. You should also comment that the gross margin is significantly lower for Deluxe Cane than for its competitors. This means that Deluxe Cane has much higher production costs. Don’t be tricked by the fact that they are able to charge slightly higher prices. The financial performance is quite bad compared to the competition. Knowing that Deluxe Cane’s competitors are a part of larger organizations selling mobility devices should worry you. Both competitors will be able to benefit from economies of scale, and they have already priced their walking canes lower. This allows them to win market share. Deluxe Cane has lost 9 percentage points market share in the last 5 years to these competitors. As discussed earlier, Deluxe Cane’s cost structure is high relative to its peers, and Deluxe Cane has a significant material procurement disadvantage. The conclusion is that Deluxe Cane is not competitively positioned – although it is in an attractive market. To answer this question, you need to analyze the target company, market performance, strategic fit and deal economics. A private equity fund does not need to have a strategic fit (as it is not a market player), but needs an exit strategy. What is the likely pricing? Will Greystone be able to meet its return hurdles (about 20% IRR)? Does Greystone have related portfolio companies that might allow for procurement synergies along the lines of what the competition is able to achieve? Can the transaction be financed? Should Greystone Partners invest in Deluxe Cane? This should be a pretty easy conclusion to make. No, Greystone Partners should not invest in Deluxe Cane primarily due to a difficult competitive position. Deluxe Cane is losing share to two competitors who are lower-priced and have significant built-in cost advantages. When you are invited to a management consulting interview, the recruiter only aims to answer the question: “Should the firm hire you?” They may ask you several questions but at the end of the formal conversation, what only matters is their one-word answer to that question. Many candidates fail in consulting case interviews because of the reasons explained below. Recruiters use consulting cases to gauge how you approach a situation. Can you break a complicated task into smaller, graspable sections? Do you have the ability to determine the factors affecting the main problem? Can you explain how these factors came into the scene? Can you come up with rational conclusions based on your findings? If the recruiter sees that you are capable of doing these things through your answers, you may be considered for the position. Case interviews are time-limited, and this time constraint is the reason why it can be difficult for you to concentrate. It can become a source of anxiety and a cause of worry. As the interviewer explains the case, panic can immediately get in the way. You have to be quick in thinking logically without rushing through things. This can be very tough if you have not familiarized management consulting frameworks. They structure your thoughts to lead you to acceptable recommendations. It’s not only the answers that matter; your confident delivery is also taken into consideration. Giving your answers in a shaky voice, with fidgeting legs and with jiggling hands may imply you can’t handle a stressful situation carefully. Recruiters will find this incompetence alarming since exhausting circumstances are common in the life of a management consultant. Moreover, poor gestures such as slouching, not making eye contact and crossing your arms make your answers and your qualifications less credible. Be mindful of your body language. It is highly possible that you will be competing with applicants as qualified as you. Recruiters get thousands of resumes each month and many applicants graduated from prestigious schools or have substantial professional experience. So when you get a chance to be invited to an interview, put your best foot forward. Expose yourself to different types of cases (like market segmentation, market sizing, mergers and acquisition and product development). The more topics you resolve, the better. Practice with a friend. This way, you get feedback on the quality of your answers, non-verbal communication and professional projection. Take advantage of case interview sessions facilitated by clubs and firms. At times, professional consultants and industry recruiters are invited to share their insights. You can’t miss that! Brain teasers are one of the possible types of questions recruiters ask during management consulting case interviews. They ask questions like these to gauge the most important quality employees must have in this industry: analytical thinking. Recruiters in all types of industries assess applicants in two different ways – through your direct answers and through the underlying messages beyond your words. For this type of question, they are more after of the latter. They look into the process of how you derive answers, of how you divide the issue up, about how logical you are in managing vague matters. Giving the correct answer will definitely add points on the scoreboard but tossing effective approaches is even more impressive. Below are some tips on how to prepare for this type of interview. Sufficient preparation does wonders. Your familiarity in resolving brain teasers has got your brain ready for getting through this challenging task effectively. Don’t simply prepare to know what to say but how to express your thoughts on the actual interview. So before the critical day, scout for sample management consulting brain teasers on the internet or in textbooks. Perhaps your contacts have materials you can borrow. Answer as many as you can. During this management consulting interview, you are expected to voice out your thoughts while trying to come up with an answer. Though this brings discomfort, exposing your brain is the only way for the interviewer to evaluate you for the position. On the brighter side, thinking aloud gives you a couple of benefits. Unconsciously, it helps you understand the problem better. Further, it keeps you fully aware of your thought processes. Do you remember the nine-dot puzzle? Those who haven’t encountered it just tend to connect the dots, the reason why they couldn’t find the correct answer. Then they start to get confused, and those who don’t practice blue sky thinking assume an answer doesn’t exist. Those who think unconventionally discover that extending the line beyond the presumed perimeter will sort things out. Do the same thing during the interview. Insight doesn’t knock on your door when you are not open to endless possibilities. Whether or not you get bewildered, don’t get boxed in! During your free time, try puzzles and riddles for fun. Answering crosswords, anagrams, Sudoku and trivia challenges polish your mind, keep your brain healthy and even enhance your memory not only for the management consulting interview but for your own sake, as well. Since puzzles have been a form of mental recreation for decades in various countries, many can be sourced for free from the Internet. Take a look at the following sites for your additional reference. A market sizing case is typically presented during management consulting case interviews. Answering this vague and grueling problem allows you to showcase your analytical skills – or lack thereof. The question, “How many curtain rods were bought in the United States last year?” is truly daunting, especially if you have to answer it within a few minutes. To nail down the question, you need to think of an effective strategy quickly, do some calculations mentally and express your ideas comprehensively. To illustrate these requirements, let’s try to sort out the question. It’s impossible to resolve the question without enough information, or at least assumptions. You can always ask the management consulting interviewer to give you more details. At times, they keep facts to themselves unless asked. However, you should not be totally dependent on them. You must come up with your own assumptions, especially for items you are confident of. Once you have your assumptions, finalize the equation that will lead you to the answer. For this scenario, you can take the paragraph below as a sample dialogue. After laying down the equation, do the math. Some firms allow you to use a calculator but if you want to earn plus points, do it mentally. Given this rationale, it is wise to practice mental calculations thoroughly before the management consulting case interview. If you are aware of the population of each state, you can make your equation more specific. For instance, you can divide the states into three categories: states with a big (1), medium (2) or small (3) population. To classify the states, you can base your assumption on the land area and level of industrialization. Obviously, you need to assume more houses in the first than the second and third groups. This method seems more taxing but it yields a more correct estimate. Note that market sizing cases during management consulting interviews do not have correct answers. Recruiters of Bain, BCG and other top tier consulting firms use them to find out how logically you process your thoughts. This is considered a main indicator of how effective you will be in solving real-life problems. Interviewers may have been trained to be unbiased, but that doesn’t mean you should not believe in first impressions during job interviews. The truth is if you don’t create an impact at that moment, you will never be called for another round. There are two ways to prepare for management consulting interviews: cognitively and physically. The former refers to readiness to resolve business cases in a structured, logical manner as well as preparing for fit interviews. The latter focuses on how you look: the first thing that recruiters notice as you step into the interview room. Your getup is the first indicator of your professionalism, and somehow it subtly affects the way you answer questions. Your choice of clothes is part of your nonverbal communication and therefore, it conveys a lot about your personality. Dressing appropriately sends a message that you respect the interviewer, the company and the situation. This sense of awareness and respect is quite important in the field of management consulting since the position requires you to work from one client to another. Different clients have different dress codes, and you must be able to recognize and adapt with their policy readily. Management consulting is a conservative industry; hence, you must put on the right clothes when you are called for an interview. Below are some tips to consider. Color – Choose a solid, dark color for your suit and tie. Black, navy or dark grey are good choices. Combination – Coordinate the colors of your inner and outer clothes. A white or light-colored shirt will go well with your dark suit. Don’t wear something too bright for it’s dazzling to the eyes. Shoes – Don’t forget to polish them before going to the interview. The color should match your clothes, too. For women, wearing closed, high-heeled shoes can make you feel more confident. Make sure you’re comfortable using them, though. Accessories – Use accessories sparingly. Big, dangling earrings and necklaces are too distracting and noisy for the management consulting interviewer. Hair – Fix it well. See to it that they don’t fall over the face during the interview. You can add some style, but you must look neat with it. Make-up – For women, apply some natural-looking makeup. Before you enter the room, check if your teeth have lipstick smudges. That can be a bit embarrassing. Cologne – You may apply a dab of sweet-smelling perfume. However, if you’re not sure of the scent, forget the idea. Just stay clean and fresh. Here are three tips to help you decide on what to wear for the management consulting fit and case interviews. Call the Human Resources Department and ask for the firm’s dress code. It’s usually safe to follow it or to dress more formally than what employees put on to work. If this is too difficult for you, get in touch with your network or look for advice on the Internet. Always complement your clothes with other nonverbal indicators. Your formal attire won’t compensate for your poor posture. The perfect color combination of your outfit proves nothing without your enthusiasm. Always stay on the safe side when choosing an outfit for the interview. It doesn’t necessarily mean you’re unfashionable; it just gives you a certain level of comfort. As you face the interviewer, you won’t have to worry if you’re wearing the right clothes. You can focus on giving the correct answers instead.